Here’s one of our favorite recipes using Old Bay Seasoning — Old Bay Seasoned Chicken Wings. It’s fairly easy to make, but you have to plan a head so that the wings have time to soak up the flavor in the marinade. These Chicken Wings take an hour to cook, so this is a recipe that takes about 3 hours to make from start to finish. Wash the chicken wings thoroughly and place on a plate. Add the vinegar, canola oil, Old Bay Seasoning and Tabasco Sauce to a bowl and mix well. If you have a Waring Blender blend these items in the blender instead of by hand. Place the chicken wings in one or two ziploc bags, add the marinade, and place in refrigerator. Marinate for 2 hours, flipping the bags over every half hour. Preheat oven to 500° F. We like to use disposable aluminum baking pans covered with non-stick aluminum foil to cook the wings for the easy clean up. You can use a regular baking pan, and cover the bottom with non-stick foil if you don’t have toss out heavy duty pans on hand. Place the wings in the pan in a single layer, and bake for one hour. Cook covered with aluminum foil for the first 50 minutes. Remove foil from pan for last 10 minutes to allow wings to brown. 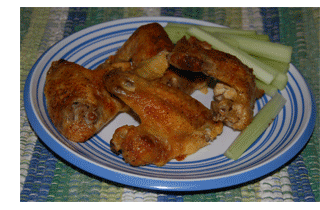 Serve the cooked wings with Ranch Dressing along with celery, cucumber, and carrot sticks. Editors Note: YES, 500 degrees is correct. Use the meaty whole chicken wings (as pictured) that you get at the grocer in the large package — not the wingettes. Cover the pan for the first 50 minutes, and then remove to let wings brown. When placing wings in the pan, place them close together and do not try to drain the marinade from the wings. Take them straight from the ziploc pack and place the directly in the pan. This is an adaptation of this tried and true Buffalo Wing Recipe we’ve used for years. I noticed the cooking time is for 1 hour at 500 degrees. Is that a typo? How do you get the wings to be crispy? Hi – I am “Old Bay Seasonings” # 1 fan in Rochester NY !!! I have even entered Chili cookoffs using Old Bay Seasoning !! But I have a complaint about this recipe – old bay chicken wings. I cooked these tonight – and at 500 Degrees F, for 1 hour,,,, They ended up burnt and dried up like firewood. Have you folks tested this recipe? >>Yup, the picture shows the finished product made following our instructions. Use meaty full chicken wings. Not wingettes. Cover for first 45 to 50 minutes. Then remove foil to allow wings to crisp and brown. I didn’t try this recipe, but I think it looks good. However, I can’t even imagine cooking a single layer of wings in a 500 degree oven for an hour. I don’t think you would have much left of the wings. This must be an error. Cook the wings at 500 degrees. No typo. Cook for one hour at 500 degrees. Cover with foil for the first 50 minutes. Remove during the last 10 minutes. When you place the wings into the baking pan, do you pour all the marinade into the pan as well? Or do you discard the marinade that has not been saturated by the wings? I am a lover of Old Bay wings. I liked this recipes, but will add more Old Bay next time as I didn’t think this was enough. I used wingettes and after reading the comments, I decreased the oven temp to 450 degrees and cooked them for about 50 minutes, flipping them halfway through. I took the foil off for the last ten minutes as instructed and flipped them halfway through the crisping phase. They came out perfectly. I tried this recipe the other night, it turned out great. I actually cooked it a little differently. I added a quarter cup more vinegar, an extra tsp of old bay, and an extra tsp of Tabasco to the marinade. Then I sprinkled more old bay on the wings before I baked it. Half way through I flipped the wings, and sprinkled more old bay again. and cooked it for an extra 5 minutes and broiled with out the foil for only 5 instead of 10. They turned out amazing! I am Maryland, and man do I love I my Old Bay, this recipe with a few tweaks turned out amazing! You can add some of the marinade, but not all. Adding a little will keep the wings moist. Nope. The temperature is correct. It’s an adaptation of an authentic Buffalo Wing recipe. You can place a cover over top of the pan for the first 30 minutes, if you desire. As always when cooking, one must keep an eye of the food. So if you feel it’s too hot, set the timer for 30 minutes, and check them. Or as others say, lower the temp some. But if they are sufficiently marinated, you should be fine at the 500° F. We make these all of the time. 500° F is fine. Watch them though, maybe your oven is hotter.